Fear not, DISH subscribers! 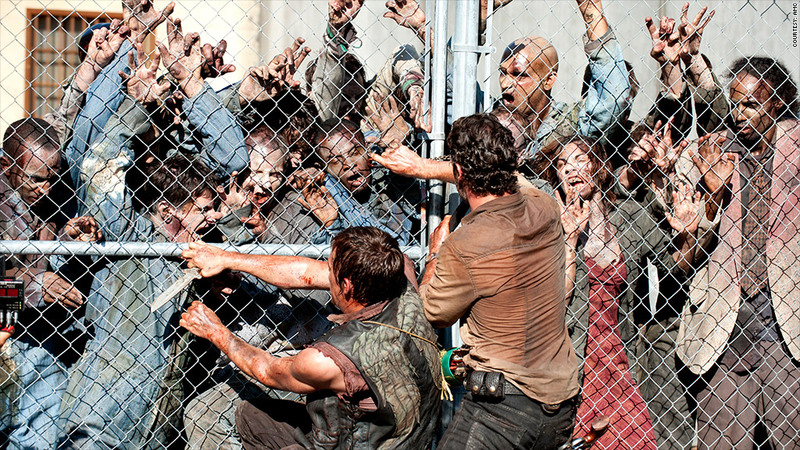 The zombies of "Walking Dead" are back on your TV after settlement of a dispute with AMC Networks. The zombies are back on DISH Network, after a deal with AMC Networks and Cablevision ended a dispute that kept "Walking Dead" and other AMC shows off DISH subscribers' TVs. The dispute left AMC -- as well as the IFC, Sundance Channel, WE tv, and IFC Films networks -- dark on DISH since July. The disagreement was over a lawsuit by AMC Networks (AMCX) and Cablevision (CVC) over DISH's decision to cut short a deal to carry AMC's high-definition service Voom HD. Under a settlement announced Sunday, DISH (DISH) agreed to pay $700 million to Cablevision and AMC Networks. It also agreed to give up its 20% stake in Voom HD. In return DISH will receive some wireless spectrum licenses in 45 separate major markets, which between them have 150 million people. "We are glad to partner again with DISH Network and are delighted to bring back our popular channels and programming to their customers," said Josh Sapan, CEO of AMC Networks, in a statement Sunday. DISH's 14.1 million subscribers represents about 13% of the homes that get AMC. The network is home to such critically acclaimed and popular dramas as "Breaking Bad" and "Mad Men," as well as the zombie-themed show "Walking Dead" that is now airing new episodes of its third season. "We are glad to have settled the case and reestablished our long-term relationships with AMC Networks and Cablevision," said Dave Shull, senior vice president of programming at DISH in a separate statement. "This multi-year deal delivers a fair value for both parties." Cablevision, a Long Island, N.Y., cable company, spun off AMC Networks to its shareholders in 2011, but the Dolan family still controls the voting shares of both companies. While AMC returned to DISH Sunday in time for the airing of this season's second episode, the other networks covered by the agreement will not return until Nov. 1. Also returning that day will be the music-oriented network Fuse, which is owned by Madison Square Garden Co. (MSG), another former Cablevision unit still controlled by the Dolan family.